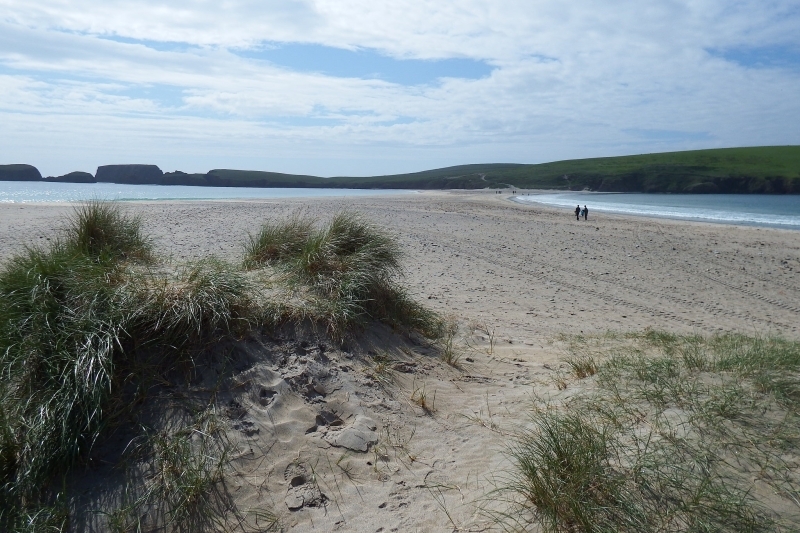 A picturesque white sand tombolo linking the South Mainland of Shetland to St Ninians Isle. This striking beach can be admired from many different vantage points as well as from the beach itself. The beach is easily accessible by road with picnic tables overlooking the breathtaking views. The tide at St Ninians Isle Beach is currently rising. High tide will be at approximately 3:45 AM, and the next low tide will be at approximately 10:24 AM. There is a large car park next to the beach with a picnic table area and litter bins. Visitors are encouraged to follow the Scottish Outdoor Access Code. Visitor information for St Ninians Isle Beach, Shetland Islands, Scotland. Weather, tides, visitor comments, beach facilities, photos, nearest postcode, beach information and nearby accommodation.